The STRING SIRENS are available to perform as both session musicians and event musicians. They are in high demand as accompanying musicians for concert tours as well as featured musicians for corporate entertainment. Just some of the contexts they are ideal for include: corporate functions, parties, launches, balls, fashion shows, weddings, accompanying solo artists and bands, as a support act, on cruise ships, on TV, in recording sessions, in video clips and advertisements. At events, the girls can perform elegant acoustic music in a background role or take to the stage to do am amplified feature spot. With serious runs on the board in the classical music scene and extensive experience in the pop and rock industry, the STRING SIRENS are equally at home on the concert platform as in a rock arena. 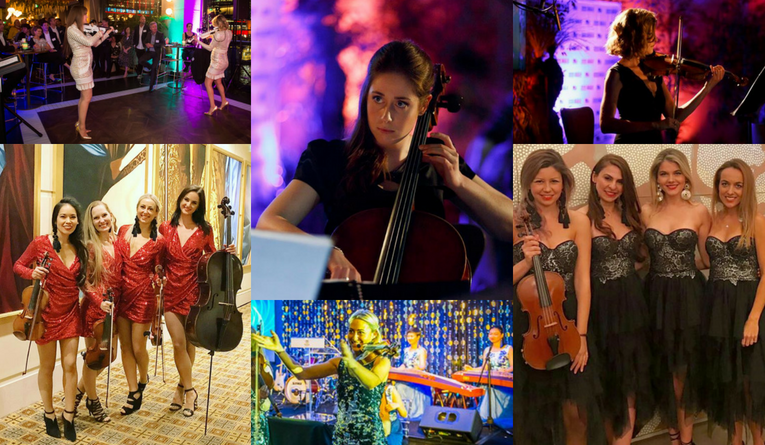 Having performed with some of the world’s most prestigious ensembles and in countless different scenarios, these sassy ladies have an extensive repertoire and their style is extremely versatile. Starting out in 2004 as a Sydney-based string quartet, increasing demand for fiery female string players saw the STRING SIRENS expand to become a nation-wide phenomenon. They now have teams in all of the major cities in Australia and can appear in a number of contexts from a soloist to a full string section. Sam Smith, Jessica Mauboy, The Whitlams, Guy Sebastian, Michael Buble’, Kanye’ West, The Veronicas, Glenn Shorrock, Ryan Tedder, Harrison Craig, Pete Murray, The Living End, Delta Goodrem, Il Divo, Ricky Martin, The Ten Tenors, Human Nature, Ben Harper, Seal, John Farnham, Bliss N Eso, Anthony Callea, Teddy Geiger, Luke Kennedy, Tommy Lee and Robbie Williams. “The Voice Australia”, “The X Factor”, “So You Think You Can Dance”, “Australian Idol”, “Australia’s Got Talent”, “Live at the Basement”, “Sunrise”, “Mornings”, “Today”, “Rove Live”, “The Max Sessions” and at The 2013 ARIAs. U2’s Bono is clearly a fan of the STRING SIRENS! The girls collaborated with Kanye ‘ West to perform as support act for U2. Whilst backstage, Bono stopped mid-entrance to the stage to give the ladies the thumbs-up, declare them “lovely” and reward them with a cuddle! The STRING SIRENS wow crowds with their explosive stage show accompanied by pumping backing tracks. They dazzle guests with their virtuosity and classical skills. Perfect as an event highlight or opener, the stage show was originally designed for a string quartet but can be performed as a solo, duo or trio act and can even be expanded to include a sea of Sirens. A special Christmas show featuring hits such as: “All I Want For Christmas” by Mariah Carey / “Last Christmas” by Wham / “Feliz Navidad” by Boney M.
An Australian themed show including iconic Australian songs: “I Am Australian” by The Seekers / “You’re The Voice” by John Farnham / “I Still Call Australia Home” by Peter Allen. *This particular show requires 4 or more Sirens. A special package for our Chinese clients incorporating modernised versions of traditional folk songs “Mo Li Hua” and/or “Gong Xi Gong Xi”. Perfect for Chinese New Year! Additional musicians playing Pipa and/or Erhu is also possible. The STRING SIRENS love an excuse to glam up and will be delighted to dress to your brief. They have a range of sequin, metallic and beaded outfits in their dress up box – from long flowing maxi dresses to form-fitting mini dresses or even wet-look leggings for an edgier look! Sydney, Melbourne, Brisbane, Adelaide, Perth based – Available throughout Australia and also internationally. SCROLL DOWN to the bottom of the page to watch and listen to MORE examples of The STRING SIRENS in action. I worked with Leah Zweck and the players from the “String Sirens” on many occasions – on television, at live events and in the recording studio. The people in this group are professional, hard-working, easy-going and superb musicians. The “String Sirens” kicked off our executive xmas function in true class and style. They read the ambience and mood of the crowd beautifully and easily adapted to adverse weather conditions and other hiccups intuitively and without prompting. They were truly professional, flexible and easy going, not to mention very talented musicians, impressing our VIP’s who are regular concert goers and music aficionados. The “String Sirens” understood my needs as a corporate events organiser and were on the mark (and on time!) with everything from correspondence leading up to the event, the performance on the evening and event follow up. I would recommend them as an asset to any corporate function. quartet than the “String Sirens” to work with. Their musicianship and dedication to getting it right in rehearsal carried through to every performance. By tour’s end they even had their own solo spot opening the second act for Glenn with a fantastic Beatles tribute! They also have the glamorous good looks that light up a stage, captivate an audience and add style and class to any show. They certainly did this for us. section leaders in a full orchestra! The “String Sirens” are great! The “String Sirens” are both sassy and classy. I programmed the “String Sirens” as part of the “Reminiscing Tour” (starring Glenn Shorrock, Wendy Matthews and Doug Parkinson). As a featured act, they opened the second half of the show with their Beatles Medley, which had the audience up and dancing in the aisles. The “String Sirens” not only brought glamour to the show, but also fun and a real positive energy. Their techno version of Vivaldi’s Summer was also one of the highlights of the “HATS OFF BrizVegas 05” concert that I produced. It was FANTASTIC that you could do the Teddy shows and I really can’t thank you guys enough for doing such a great job. You were all beautiful, sounded brilliant and were a pleasure to be with. All those qualities all bundled together are too rare these days, so thank you. Watch The STRING SIRENS performing with MICHAEL BUBLE’ – The world premiere of his latest single “When I Fall In Love” – Sydney, October 2018. Watch The STRING SIRENS performing “I Have Nothing” LIVE on THE VOICE AUSTRALIA with ANJA NISSEN – Sydney, July 2014. Watch The STRING SIRENS performing “Feeler” LIVE with PETE MURRAY at The Lord Mayor’s New Year’s Eve Party – Sydney, December 2013. Watch The STRING SIRENS performing LIVE with BLISS N ESO at the ARIAS – Sydney, December 2013. Watch The STRING SIRENS performing “If” LIVE on THE VOICE AUSTRALIA with Harrison Craig – Sydney, June 2013. Watch The STRING SIRENS performing “You Ruin Me” LIVE with THE VERONICAS – Sydney, November 2014. Watch The STRING SIRENS performing with DELTA GOODREM – the debut of her single “Heart Hypnotic” – exclusive to THE VOICE AUSTRALIA – Sydney, June 2013. Watch The STRING SIRENS performing “Smile” LIVE on THE VOICE AUSTRALIA with RACHAEL LEAHCAR – Sydney, June 2012. Watch The STRING SIRENS performing “Windmill” LIVE on THE VOICE AUSTRALIA with DANNY ROSS – Sydney, June 2013. Watch The STRING SIRENS performing “Uninvited” LIVE on THE VOICE AUSTRALIA with JAC STONE – Sydney, May 2013. Watch The STRING SIRENS appearing at 3:20 in this film clip with EVOKE.